Season 2 of Yellowstone premieres Wednesday, June 19 at 10 p.m. ET/PT on the Paramount Network. Pictured left to right on porch – Beth Dutton (Kelly Reilly), John Dutton (Kevin Costner), Monica Long (Kelsey Asbille) and Jamie Duttong (Wes Bentley). Front row – Kayce Dutton (Luke Grimes) and Rip Wheeler (Cole Hauser). 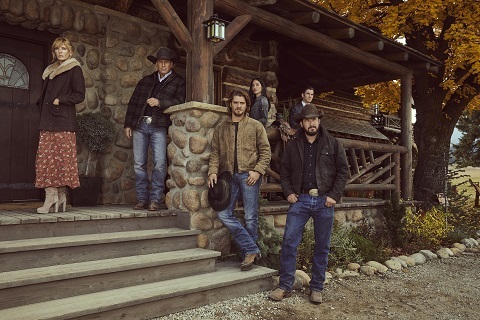 Season two of Yellowstone debuts on Paramount Network on June 19th at 10 p.m. ET/PT. New York, NY, March 21, 2019 – Paramount Network today announced that season two of hit series Yellowstone will premiere on Wednesday, June 19 at 10 p.m., ET/PT and shared a first-look photo of Season 2. The first season averaged 5.1 million total viewers per episode, making it 2018’s most-watched new cable series and ranking second across all cable TV series for the year. What do you think? Have you seen Yellowstone? Will you watch season two? More about: Paramount Network TV shows: canceled or renewed?, Yellowstone, Yellowstone: canceled or renewed? We didn’t have any interest in getting Netflix until we heard about Yellowstone, so we subscribed to it just because of this see show. We were not disappointed! Hope it last for years! Best show ever. I love Kevin Costner. I hope it goes for a few years. I am thrilled to hear Yellowstone is coming back. I was so disappointed that there were only 9 episodes. As soon as I heard about the first 9 I could hardly wait for them. This is an awesome show. I’ll be in the front row to watch Kevin Costner’s role again. Definitely!!! I cannot wait to pick up where we left off. I hope there will be more episodes this season. I really enjoyed Kevin Costner, seeing other great actors and “meeting” actors new to me. The entire cast created the feeling that we the viewers were a part of the drama. I do so agree with you, this is so great that it got wonderful reviews. I’m glad I’m not alone in my adoration. Absolutely plan on watching and recording every moment!! Been waiting with bated breath for any news of it’s return. The show has already featured some of the most fascinating characters. The preliminary character development during season one certainly sets the tone for great episodes to come. I absolutely adore Kevin Costner and had every expectation that he would be awesome. The other actors being spectacular in their given roles is just icing on the cake with maraschino cherries on top!!! Ummmm…absolutely!!!!! LOVE this show. Hope season 2 has more episodes!!! Can’t wait!!!! This show is awesome, any word on how many episodes for season 2? The show is great! Good story and attractive actors. Love them! This show was great. Hurry up June. Glad its Coming back. I can’t wait for season 2 to begin! I loved Yellowstone & recorded all of them to be able to keep watching again & again. Love the show. Will absolutely watch the second season. Can’t wait, June is around the corner. Yes I will watch it!